I went by Borders the other day when everything was 50 to 60% off. I got some presents for Son Number One and a few books for myself that were about $3.20 each. But one book not only caught my eye, it kept drawing me back. I just had this feeling I should buy it, even though it was a whole $8.60 practically the most expensive item I bought. It seemed really outrageous to buy an $8 book for me when I was A) broke and B) already spending way to much. But I just felt I should buy it. 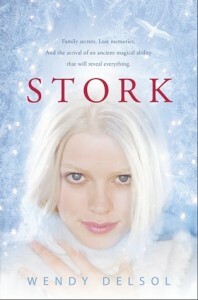 The book is an YA called Stork, about a teenage girl who moves from CA to Minnesota, where — in addition to lusty jocks, snarky queen bees, and intriguing boys — she finds herself inducted against her will into the Islantic Stork Society–a society of old women who help unborn babies find their right mothers. While the women are never referred to as witches, I thought the the portrayal of the old women, how they worked and what they did, was one of the most understandable and interesting of any coven-like group I’ve ever seen. The other magical things in the novel were really cool, too. Very low key and yet intriguing. September 4, 2011 in Uncategorized. ← Professor Crazy reviews John’s Orphans of Chaos.